Honey Lime “Guacamole”… or “A Twist on Guacamole” – Dancin' and Cookin' in the Kitchen! Dancin' and Cookin' in the Kitchen! Cooking with whole and healthy ingredients while dancing with my kids in my kitchen! Remove husks from corn and grill over medium heat for 10 minutes. The corn should have some brown spots and be tender and not mushy. Cut the corn off the cob then scrape the cob with the back of your knife to get the juices. Set aside and let cool. Slice the tomatoes in half. Dice the avocado and chop the cilantro. 1. Add all the dressing ingredients in a small bowl and whisk to combine. Set aside. 2. Combine the sliced tomatoes, avocado, cilantro and grilled corn and honey lime dressing and mix gently so everything is evenly coated. Be careful not to mash the avocados. Let the salad sit for 10-15 minutes to let flavors mingle. Enjoy. 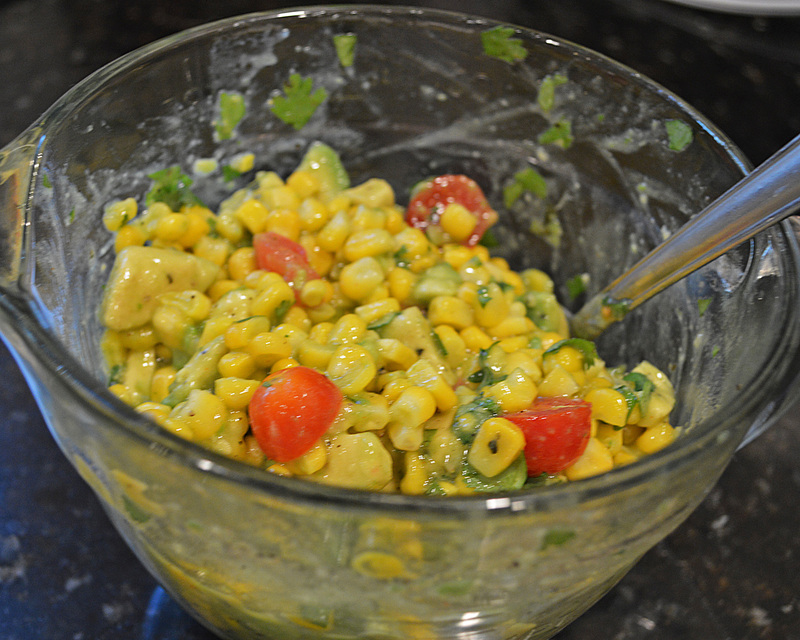 This entry was posted in Mid-day, Snacks and tagged avocado, cilantro, corn, grilled corn, honey, lime, tomato. Bookmark the permalink.